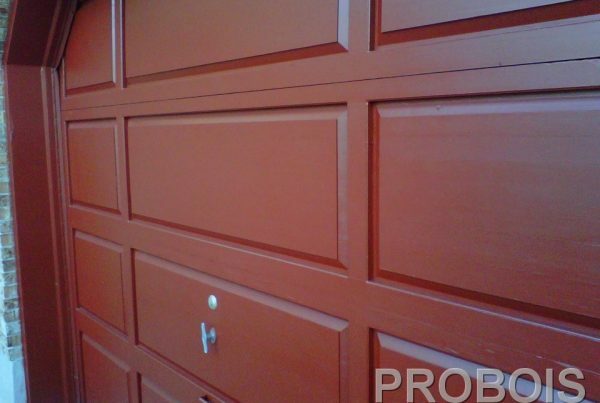 PROBOIS, for all your restoration, maintenance and stain-application projects on wood doors and garage doors made of wood. 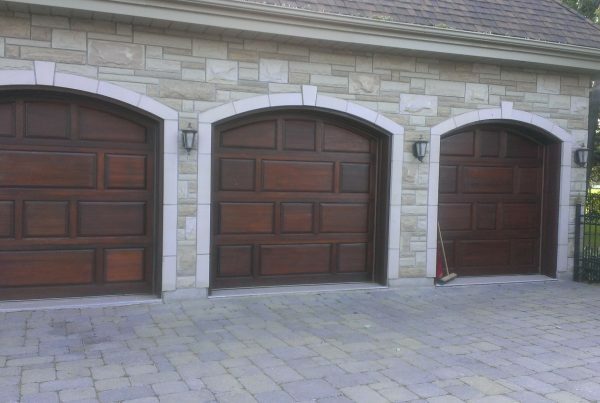 We are masters of restoration, maintenance and stain-application on wood doors and garage doors made of wood. 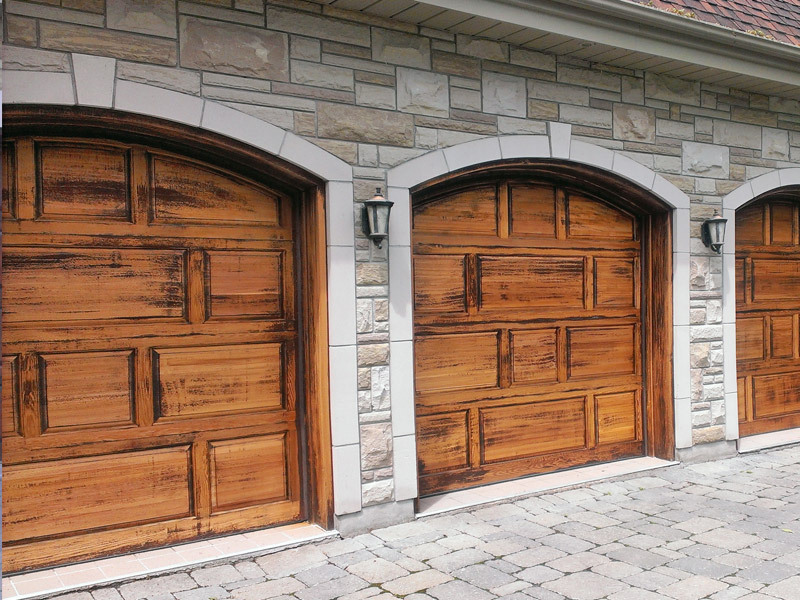 Whatever the condition of the wood or the stain, we are able to restore your doors and garage doors. We begin by washing the wood with a pressure washing machine. This step allows us to remove any dirt that may have accumulated. We use a wood cleaner to increase the efficiency of this step. It is very important to use a low pressure during this step to prevent the water from penetrating inside the wood. 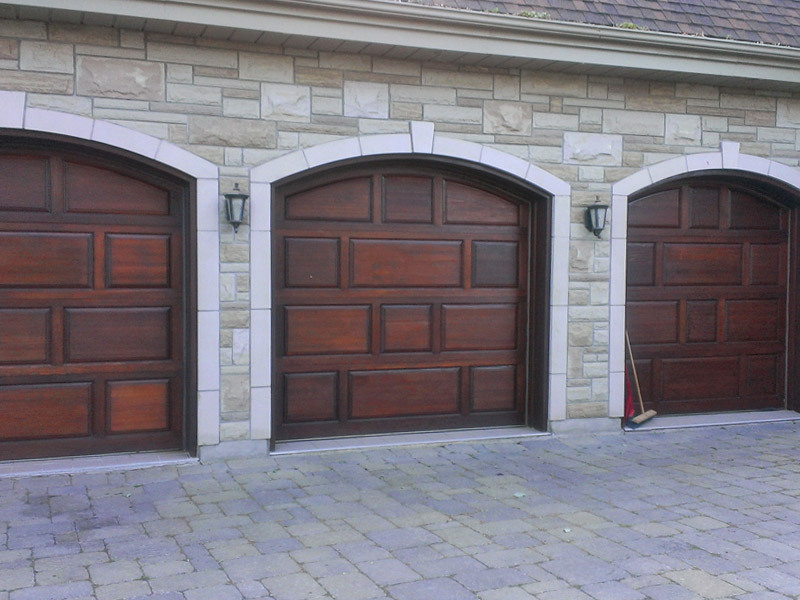 The neutralization process of a door or garage door is very fast and simple once the surfaces are properly cleaned. We use a premium brightener to neutralize all the surfaces of the wood and following this we rinse the product off. 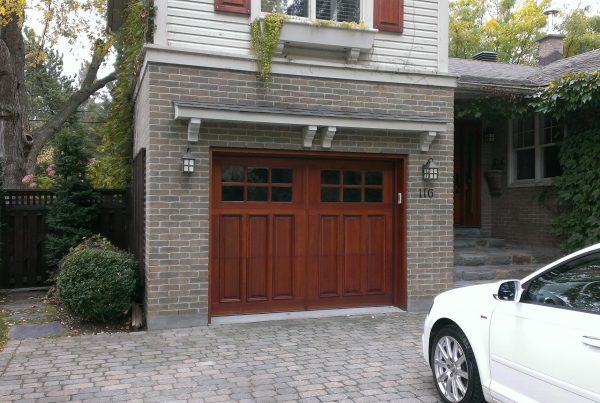 The stripping of a door or garage door is a very intricate process. It’s impossible to strip the stain with a stain stripper (since the product might infiltrate the wood), we have to strip the wood by sanding it. The stripping process is intricate because of the moldings of the door. Nevertheless, our specialized tools help us finish the job in a reasonnable amount of time with the best finish possible. 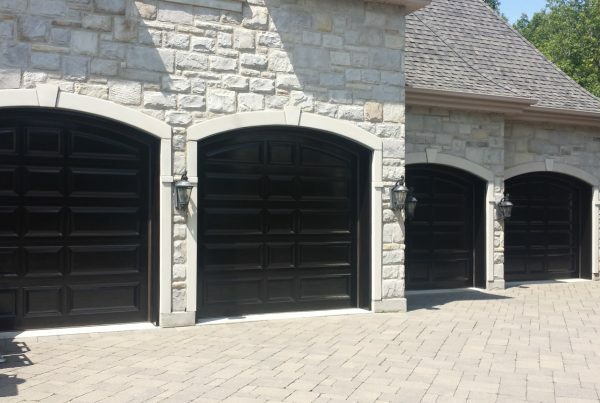 With more than 50 finished projects on doors and garage doors, we are confident they we will be meet your expectations. The sanding of the surfaces has to be done precisely to take care not to modifie the original aspect of the wood. 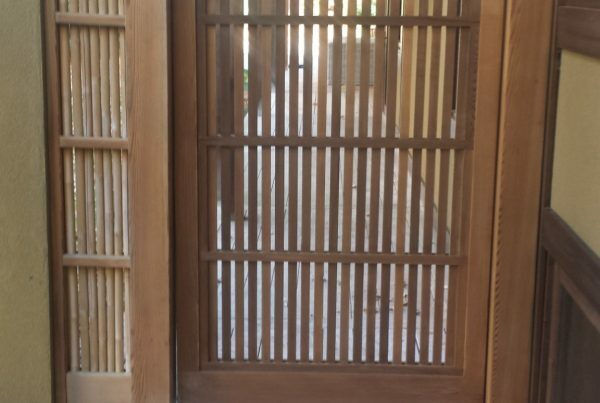 Indeed, the moldings often found on these doors can easily be damaged if the proper care is not taken. Thus, we make absolutely sure to use good tools and to work as precisely as possible to correctly sand the surfaces of the wood. Always done with a fairly large grit at first (60 to 80), we smoothen the surfaces with grit 120 and 150 afterwards. This will ensure a beautiful finish that will embellish the garage door. As always, we clean the surfaces with acetone or methyl hydrate to free the pores of the wood from any dust. This helps the stain penetrate the wood during the stain-application process. Two coats of later or oil-based stains is applied with cheesecloth. The use of cheesecloth allows us to work very precisely and enhances the aspect of the wood. Afterwards, we appy a sealer with a brush to protect the stain. 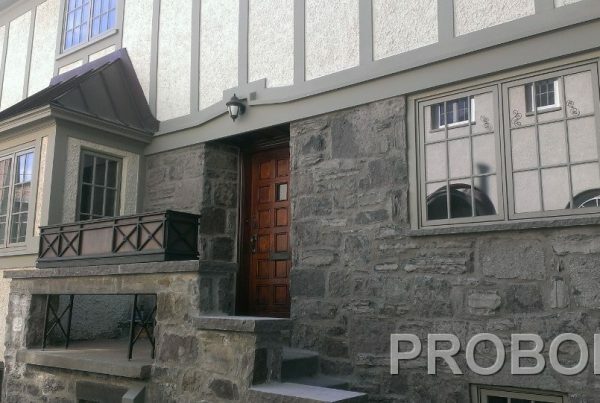 Maintenance : One coat of sealer every three years if often enough to protect the wood adequately. However, an annual inspection is recommended to avoid any unpleasant surprise. When an opaque stain is used, we apply two coats on the wood. The stain that we use is the best on the market and is offered in all finishes and almost unlimited variety of colors. Additionally, the stain we use is elastic and is therefore very easy to wash. Maintenance : One coat of stain every three to four years is enough to protect the wood and revive them. The surfaces that are very exposed to sunlight may need a second coat to ensure a good protection. It is very rare that we use paint during our restoration or maintenance projects when it comes to doors and garage doors. We recommend paint when a door has been repaired with the use of epoxy paste. In this case we will apply two coats of paint on the wood to protect it. Maintenance : We apply one or two coat depending of the deterioration. We always use a premium quality paint that last as long as possible. We strongly recommend the use of the original product when restoring or maintenant wood that has already been stained or painted. This is why finding which product was originally used on the door is important and will help avoid any complications related to compatibility between two products.